This was the first of several severe downturns that would tarnish America's otherwise vigorous economy throughout the 19th century. The Bank of the United States, far from helping the economy, was among the destabilizing forces that led to the depression of 1819. The Second Bank of the United States was supposed to steady the economy, but gross mismanagement in its early phase sapped its effectiveness. All the way back during the Presidency of James Monroe, American workers got a harsh lesson in the vicissitudes of capitalism when the economy crashed. The Panic of 1819 initiated the nation's first major depression. As in the case today, that crash, too, resulted from a confluence of national and international events. In the heady atmosphere after the War of 1812, both U.S. imports and exports surged. European demand for American goods, especially agricultural staples like cotton, tobacco, and flour, increased. To feed the overheated economy, state banks proliferated, and credit was easy. The federal government offered for sale vast tracts of western lands, fueling real estate speculation funded by bank notes. Reserves of specie, or hard money, plummeted, especially in the West and the South. As early as 1814, Thomas Jefferson warned, "We are to be ruined by paper, as we were formerly by the old Continental paper." Two years later, he asserted that "we are under a bank bubble" that would soon burst. The bank's first president, William Jones, instead of taking steps to regulate the nation's currency, doled out huge loans that fed speculation and inflation. He also kept lax watch over state banks, where fraud and embezzlement created chaos. A congressional committee's proposal to terminate the nearly insolvent Bank of the United States had little backing — because 40 members of Congress held stock in the bank. The bank's problems arose at precisely the wrong moment, when the economy needed a firm rudder during its postwar expansion. Jones resigned and was replaced by the South Carolina congressman Langdon Chews — and later by the Philadelphia lawyer Nicholas Biddle. Although the bank sharply contracted loans in 1818, the damage had been done. The Bank of the United States, far from helping the economy, was among the destabilizing forces that led to the depression of 1819. At the same time, swelling crop yields in Europe reduced the demand for American farm products, whose prices plunged. An economic contraction in Europe led banks there to reduce credit. The crisis abroad, coupled with the contraction at home, forced American banks to call in their loans as well. By early 1819, credit, once so easy, was unavailable to many Americans. With specie reserves depleted many American banks failed, and other businesses followed. Sales of public lands plummeted. Unemployment soared, and in some regions food and other basic necessities were difficult to come by. Especially hard hit were cities outside of New England like Philadelphia, Pittsburgh, and Cincinnati. Farmers suffered too, though many survived by resuming a subsistence lifestyle. With insolvency rife, prisons were overcrowded with debtors. The depression lingered for two years. It was the first of several severe downturns that would tarnish America's otherwise vigorous economy throughout the 19th century. The Panic of 1819 fostered mistrust of banks, bankers and paper money. The volatile Tennessee politician Davy Crockett spoke for many when he dismissed "the whole banking system" as nothing more than "a species of swindling on a large scale." The aging Thomas Jefferson complained that the new generation, "having nothing in them of the feelings or principles of '76, now look to a single and splendid government of an aristocracy, founded on banking institutions, and money incorporations… riding and ruling over the plundered ploughman and beggared yeomanry." This mistrust of corporations was aggravated by landmark decisions handed down in 1819 by the Supreme Court under Chief Justice John Marshall. In Dartmouth College v. Woodward, the Supreme Court protected private corporations against interference by the state governments that had created them. In McCullough v. Maryland, it ruled that the Bank of the United States, though privately run, was a creation of the federal government that could not be touched by the states. These pro-capitalist court rulings aggravated class divisions, which escalated over the next decade. The 1820s saw the meteoric rise of Andrew Jackson, who defended working-class Americans against what he characterized as the oppression of a wealthy elite epitomized by the central bank. The recession of 1819-1822, which was blamed largely on bankers, was one of the economic forces that made many Americans look to Jackson as the savior of the working class. 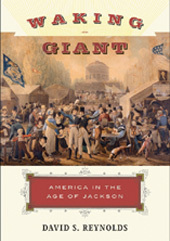 Editor’s Note: This feature is adapted from Waking Giant: America in the Age of Jackson by David S. Reynolds. Copyright 2008, David S. Reynolds. Reprinted with permission of the author. Can Obama Save U.S. Banks?